How many ? 2 units in stock. 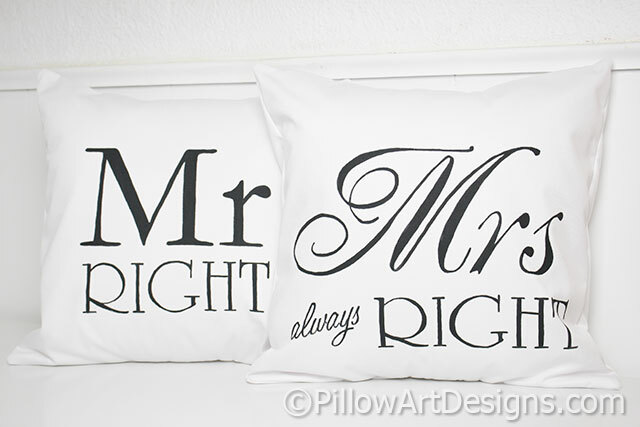 A set of couples his and hers pillow covers, Mr Right and Mrs Always Right. Made to fit 16 X 16 inch pillow inserts (not included). Outer fabric is white cotton twill. Covers are fully lined with white cotton polyester for a nice fit and finish. Seams are double stitched for durability and overcast to prevent fraying. Hand painted with black non toxic fabric paint. 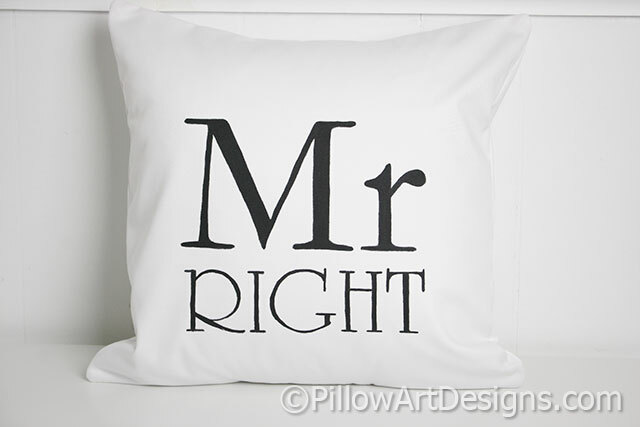 My pillows are designed to add a spark of artistic interest to your room's decor, something out of the ordinary, perhaps personalized to make a special custom statement. All my decorative accent pillows are handmade and hand painted solely by me, with the exception of the Fine Art Pillow line you see here on my site. The Feather Sisters fine art pillows are a collaboration with my sister, Canadian artist Carol Henderson-Pew. We use high quality fabric paints and fabrics to create our pillows. All pillows are available with insert included, or as cover only, should you wish to use your existing pillow insert. All items on my site are created in a smoke free and pet free environment. Our decorative pillows make refreshingly unique and one of a kind gifts. Also great for use in home staging and boutique decor! 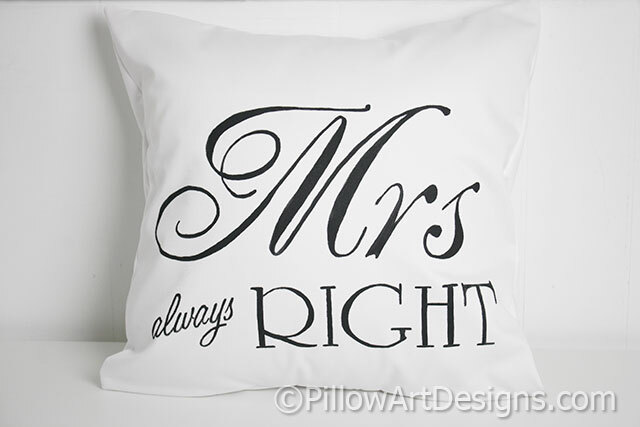 Your Pillow Art Designs pillow cover has been lovingly created using high quality fabric paint and quality decorative fabrics. Your pillow cover can be spot cleaned, dry cleaned or in some cases hand washed if required. Where coordinating light and dark coloured fabrics have been used, spot cleaning is recommended to keep the fabrics vibrant for years to come. If you are purchasing more than one item, I will combine shipping for you. Simply email me here for a discount code to adjust your shipping charges. I use UPS to ship your purchase. It will be packaged well and you will be provided with a tracking number to allow you reference and tracking to delivery. Please remember, you are responsible for any customs or brokerage fees if applicable in your country of residence. Your hand painted pillow will be shipped within 3 days of purchasing an 'in stock' pillow. When purchasing a custom created pillow, please allow 2 weeks for me to create and ship your pillow. In most cases your order will be complete and shipped much earlier. Refunds and Exchange: Please contact me prior to returning an item. I will try to resolve any situation you are less than pleased by. I make sure my items are well represented here, so that you are entirely sure of the quality and style of your item prior to receiving it. In the event you need to return an item, I will refund the cost of the item, excluding shipping. As you can understand, custom orders are not subject to refund.